The latest information about the Auburn Triathlon races in Auburn, CA. Most of you are aware that we partnered last year for the 2018 Auburn Triathlon, but the partnership has since been dissolved so Tahoe Peak Endurance is now once again the sole race promoter. Tahoe Peak Endurance (AKA Colleen and Joe), want to inform you that due to changes in our current work responsibilities we will be unable to promote the event and will be taking a hiatus for 2019 season. Joe and Colleen love the Auburn Triathlon, so this has been a very hard decision to make. We became the promoters of this grass roots event to try to keep it alive among all the Branded events and hundreds of other triathlons that are put on in the Northern California area. If there is anyone out there who has the same passion for the Auburn Triathlon as we do and would like to “Save the Tri” please do not hesitate to contact us. We apologize to those who count on this race every year to see how tough they are and we understand it might disrupt the momentum of an annual event, but sometimes hard decisions are the right decisions. We appreciate everyone who has participated from those who did it only once and clicked it off their bucket list to those who counted on seeing if they were still Tough Enough year after year. Joe and Colleen wish you luck in training for the 2019 triathlon season and of course wish you luck in any other triathlons or races you may participate in. We will keep you posted on our future plans. 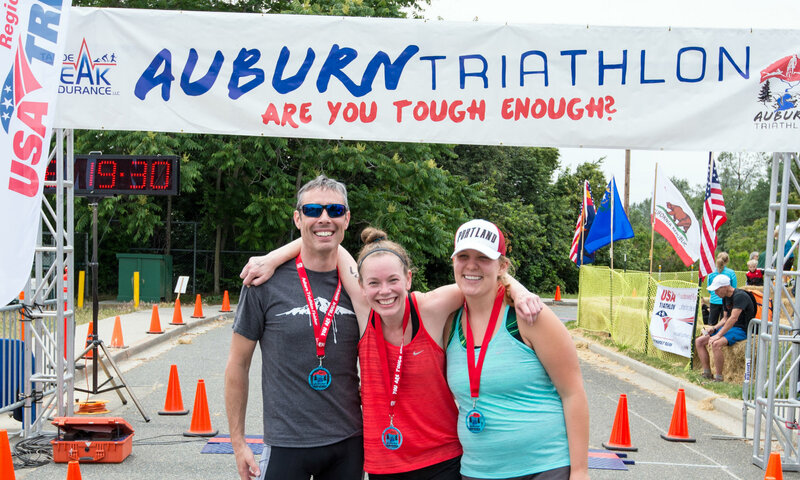 Many thanks to all who raced, volunteered, spectated, or otherwise contributed to the success of the 2015 edition of the Auburn Triathlon. It was a great day for racing and we really appreciate the support of everyone. Visit the Results page for the 2015 Auburn Triathlon results courtesy of Capital Road Race Management. Visit Facchinco Photography and David Barbal Photography for some awesome photos! For a brief race report on the events of the day check out the Auburn Journal. We couldn’t of asked for a better day! With temps approaching the 100s just days before the 12th Annual Auburn Triathlon, race day temperatures at the swim were 57 with daytime highs maybe upper 70s. Water temperature was 71! A gorgeous weekend and a perfect day for a triathlon. With 407 participants registered for one of the 4 events of the Auburn Triathlon, 344 participated race day. The waters were calm at Rattlesnake Bar till the horn went off at 7:00. Every 5 minutes a wave of swimmers would hit the water joining the lifeguards and safety personnel already out on the water on jet skis, paddleboards and kayaks. Dan Ingals of National Marine safety set the course for the events and provided water safety as did the Folsom State Park lifeguards. Our swimmers were well watched, guarded and protected. First to exit the water was Rob Laurie, of Incline Village with a swim time for the International of 20:11.6. Linda Hora was first female out of the water with a time of 22:37. In the World’s Toughest Half the fastest swimmers were Justin Smith of Davis with a time of 25:35 and Amanda Mattioli with a time of 29:10. Both Justin and Amanda each won the ZOOT Z Force 1.0 Wetsuit provided by our Swim Course Sponsor Rocklin Endurance Sports. For the Mini Tri first out of the water was Brynda Larsen, age 51, with a lickety split time of 8:15. Ian Smith, 19, was first for the men in a time of 8:35. In the NEW World’s Toughest Aquabike, the fastest swimmer was Wendy Buchanan of Tahoe City, swimming the 1.2 mile course in 34:17 followed by Mike Scott with a time of 34:23. Then onto the bikes with a climb right out of the transition. All the major intersections were posted with either CHP, or Auburn PD as well as there were many volunteers out there at various places along the course watching out for the cyclists’ safety. The fastest cyclist of the day for the Mini was Michael Cordova riding up from Rattlesnake Bar in a time of 26:52. Kelly Hammerstone rode the uphill course in 31:03. For the International the fastest bike time for the men was from last years previous winner Chris Cloyd of Truckee with a time of 1:11:08. Reno Area Triathlon Club’s Dana Ginsburg came in with the fastest bike time for the International Women in 1:25:36. In the World’s Toughest Half , Justin Smith also took top honors for the fastest bike time, 2:43:41 with Susannah Breen coming into T2 with a bike time of 3:06:03. Both Justin and Susannah each won $100 gift certificates to Bicycle Emporium, Auburn Triathlon’s Bike Course Sponsor. For the Aquabike Ann Erickson clocked the fastest bike time for both men and women, 3:09:07 that was fast enough for her to take the Overall win for the World’s Toughest Aquabike, again for both men and women, way to go Ann! In the men’s division Jerry Wilcox biked the tough bike course in 3:45:50. Fastest Mini male runner was Taylor Hocket in 15:41 and 19 yr old Hannah Halverson of Truckee ran the canal trail in 19:48. Fastest International runners: Shane Arters, Team Zooters, ran the course in an awesome time of 44:33. Linda Hora once again stole the show for the fastest run for women with a time of 48:46. Matt Balzer and Susannah Breen were the fastest runners on the new/old World’s Toughest Half run course, each winning a pair of Salomon Shoes presented by Salomon and Alpenglow Sports of Tahoe City whom partnered to sponsor the WTH Auburn Triathlon’s Run Course. Matt Balzer owner of Reno Running Company, a Partner of Auburn Triathlon, donated great prizes to the raffle. Matt’s time was 1:31:46 and Susannah clocked a 1:40:07. Overall male winners for the Mini Tri were Taylor Hockett, 31, in a time of 57:53 followed by Michael Cordova, 30,in a time of 58:13 and coming in third to round up the podium was Dawson Smith, 15, in a time of 1:00:52. For the Women in the Mini Tri we had Kelly Hammerstone, 35, taking top honors with a time of 1:05:40. 16 year old Hannah Halverson of the Wild Cherries Team from Truckee was second in a time of 1:06:32. Angela Raimondi, 25, was 3rd, 1:08:06. First for the men in the International was Shane Arters,49, of Team Zooters, second was last years winner Chris Cloyd, 29, followed in third by Matt Harder,41. Their times respectively: 2:22:09; 2:24:12; 2:29:12. First for the women in the International was Dana Ginsburg, 49, with a time of 2:46:33; Joanne Glichrist, 44, was very close behind with a time 2:46:48. Then Linda Hora, 50, not too much further back was 3rd in a time of 2:47:25. The Aquabike was won by Ann Erickson, 53, 4:04:47 followed by Wendy Buchanan,43,in 4:12:47. In the Men, Jerry Wilcox, 53, was first with a swim/bike time of 4:28:36. Second was Gregg McKenzie, 44, 4:39:18. The Overall Winners of the World’s Toughest Half went to Justin Smith, 32, in a time of 4:45:47 and Susannah Breen, 33, 5:34:50. Both Justin and Susannah won ZIPP’s Vuka Alumina Aero Cockpits. Following close behind Susannah was Joanna Pomykala, 38, with a time of 5:35:24 and our own Robyn Soares, 40, crossing the finish line in 5:48:16. Chasing down Justin was Matt Balzer, 33, closing the gap in on the run, crossing behind Justin in a time of 4:52:30. Keith Jamtaas, 35, was third fastest in the World’s Toughest Half in a time of 4:55:53. Congratulations to all the winners, and congratulations to all who finished any of the Auburn Triathlon events. We do hope you all had a great, challenging enjoyable day and we hope you all will come back and try to PR the course. Challenge your friends to a great race. We would love feed back so please do not hesitate to email us with ideas, suggestions, recommendations. We did send out a survey if for some reason you did not receive it or would like us to resend it to you contact us. See you next year, please spread the word, lets work together to grow this race and make it one of the best and toughest races in the West. Results of the 2014 Auburn Triathlons, courtesy of Capital Road Race Management. Race photos courtesy of Facchino Photography. More photos of the event can be seen at Dave Barpal Photography. Read the 2014 Auburn Triathlon Race Summary here. 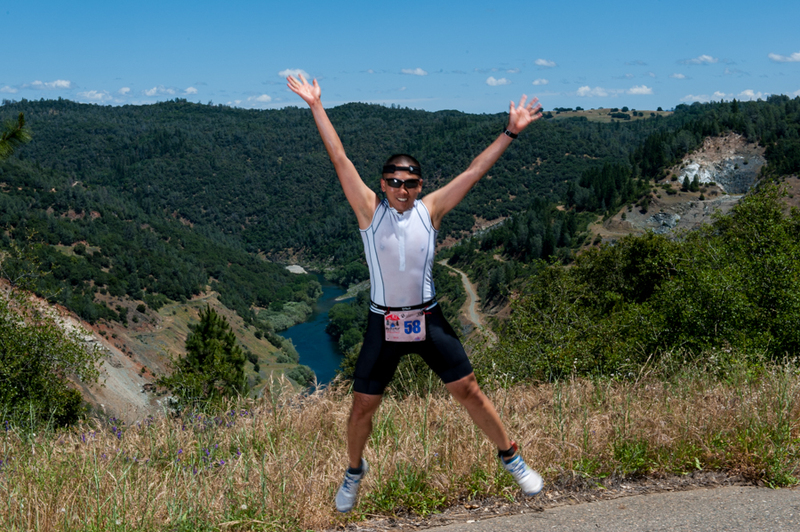 It makes sense that in Auburn, CA, the place that proclaims itself as the Endurance Capital of the World, you would name your triathlon, The World’s Toughest Half. At least that is what Brad Kearns, a former world-class professional triathlete and resident of Auburn, thought when he started the Auburn Triathlon twelve years ago in the town famous for being the finish of the Tevis Cup 100 mile horse race and one of the toughest long distance running races in America, the Western States 100, both of which travel from Squaw Valley to Auburn. The World’s Toughest Half is a half-Ironman distance event. The competitors swim 1.2 miles, bike 56 miles and run 13.1 miles. With the Sierra foothills steep hills and rugged trails it is billed as one of the toughest courses in the world. Brad Kearns originated the Auburn Triathlon after spending nine years as a pro triathlete. After moving to Auburn it didn’t take him long to decide that it was the best place in the world to train for triathlon. What Brad found in Auburn was lovely rural countryside for the ride, beautiful American River Canyon views and steep drops for the run, and a quiet cove at Folsom Lake for the swim; the makings of a great triathlon. Since Auburn didn’t have a triathlon of its own, Brad decided to start one. in 2012, Auburn Triathlon changed hands to Colleen Conners-Pace and Joe Pace both of Tahoe Peak Endurance, LLC. Colleen Conners-Pace and Joe Pace will be going on their second year as Race Directors of the Auburn Triathlon. Colleen, a lifelong Sierra resident, and Joe bring to the Auburn Triathlon years of endurance experience, not only from having participated several times in the World’s Toughest Half, competing in XTERRA and Ironman triathlons to ultra distance running events. In 1980, Colleen completed the Western States 100, ending her very long day with a run across the infamous “No Hands Bridge” that crosses the confluence of the North Fork and Middle Fork of the American River, depicted in their new logo design for the triathlon (created by Colleen’s nephew, Ty Conners). 33 years later, Colleen attempted the Western States 100 again, finishing 78 of the 100 miles after having knee surgery the previous March. Joe competed in the Inaugural Ironman Lake Tahoe, finishing 10th in his age group. Joe and Colleen, having passion for competing in challenging events, will look at the triathlon through the eyes of competitors.